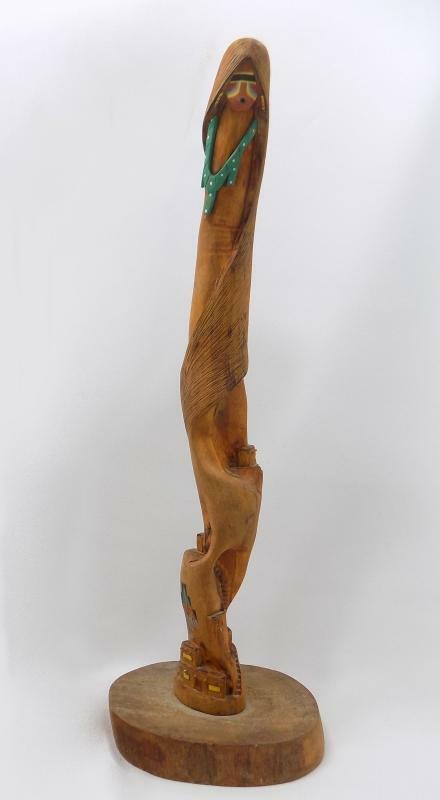 These tall, fascinating Native American sculptures were hand carved and hand painted by F.D. Aragon, from the Acoma Pueblo in New Mexico. 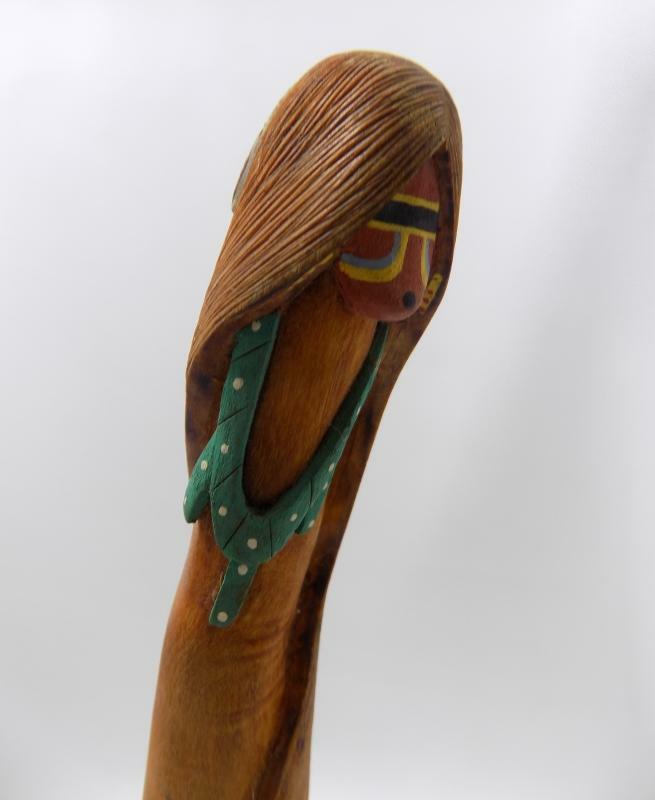 Intricately carved of cottonwood root and hand painted in turquoise, yellow, white, red and black, these sculptures are a modern take on the traditional "Long Hair" katsinas, dolls that represent spiritual beings. Since the Long Hair beings' purpose was to bring rain, their cascades of hair represent falling water from the sky. 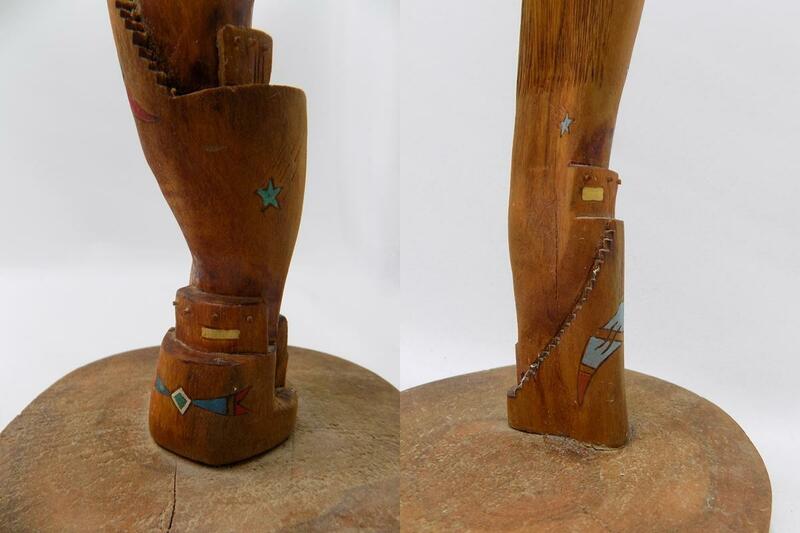 This pair of carvings has so many details, we will mention just a few for each. 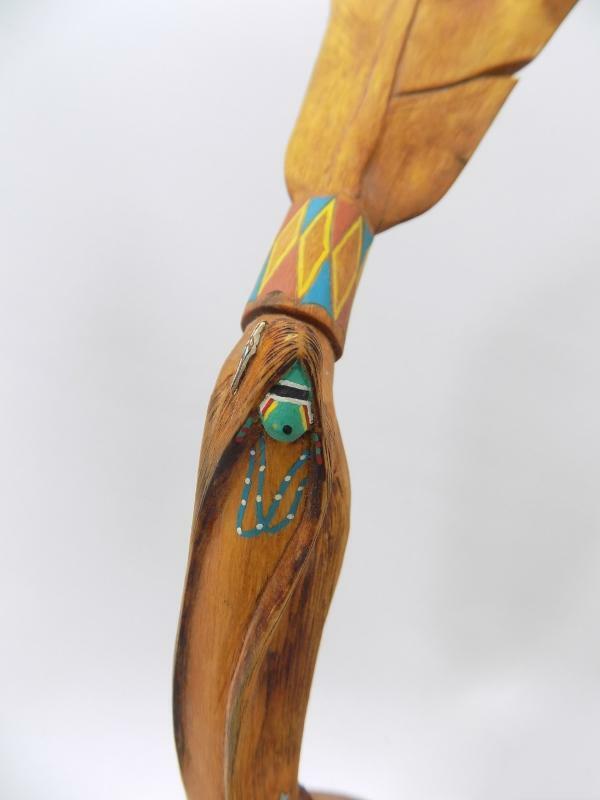 The taller of the two Long Hairs is topped with a beautifully carved feather that has a drum at its base that's decorated with turquoise and yellow diamonds. 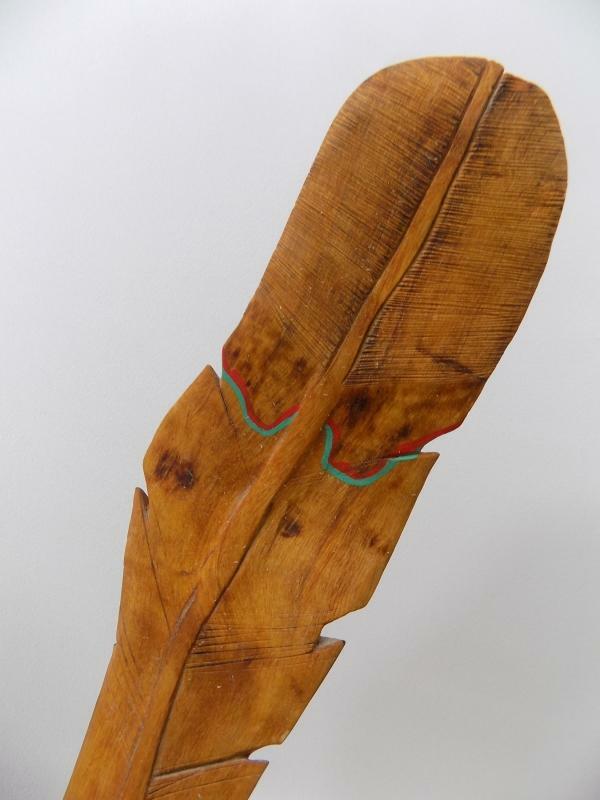 The feather is 9 inches long, with the entire piece measuring 16 inches tall on an oval base about 4 inches by 5 inches. The tiny being has a paint-decorated face, is wearing turquoise beads, and is surrounded by long curving hair with a carved, painted feather in it. At the base is a carved representation of Acoma Pueblo, atop the steep ascending steps. The Long Hair being is at the top of the 14 inch tall companion sculpture, wearing three feathers on the back of his head. He also has a painted face, a turquoise necklace and hair so long it wraps around the piece. There are three separate representations of Pueblo buildings skillfully carved down the length of the cottonwood root, which also ends in an oval base. The bottoms of both bases are signed. carved into the wood, the marks reading: LONG HAIR FD ARAGON ACOMA NM. On both, the letter G in Aragon has a carved feather suspended from it. Each carvings weighs about 5 ounces. 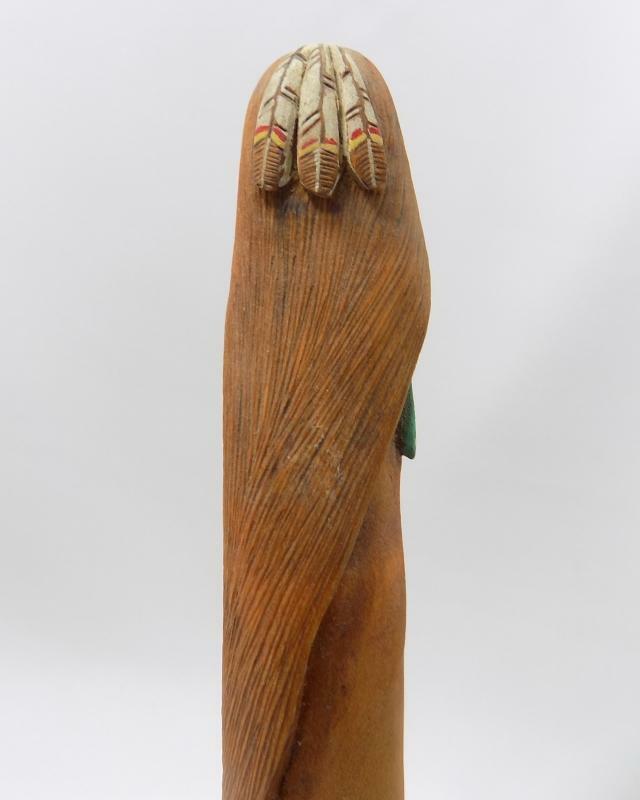 Unlike katsina dolls, these carvings are fine art, meant to be decorative while conveying Native American traditions. They are both in excellent condition, each having a crack in the base that appears to be natural to the wood slab. 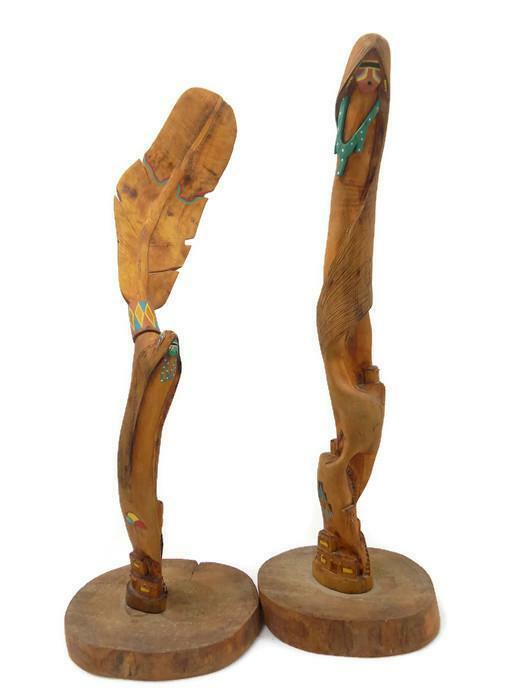 These sculptures are a wonderful addition to a collection of Native American art and can also stand alone as modern sculpture. Note: Price is for the pair, sold as a set.